Left unchecked, veld and forest fires can cause widespread destruction to property. More serious is however the risk posed to the human lives of those traversing in areas prone to veld and forest fires. These risks include not only the fire itself but also the road safety risks of poor visibility caused by smoke and the health risks of smoke inhalation. It is important for the safety of motorists that we share information on these risks as well as recommendations on how to act if confronted with these dangers. Natural fires: They typically occur seasonally and the primary source of ignition is lightning. Due to the source of ignition, occurrence is most frequent during the rainy seasons. Unnatural fires: They result from the intervention of humans and purposeful or accidental ignitions. Due to the source of ignition, frequency is usually higher than natural fires. These fires mostly occur in the dry season (often protracted by late rains). When planning a trip during the fire season, check to see what the weather conditions will be like in the area and listen to local radio stations for news on any fires in the area. Keep maps of your route and frequent travel destinations in your car, and know at least two ways of getting anywhere. If an emergency happens and your primary route of travel is closed, you'll already know another way to get where you're going, or you'll only need to pull over and read the map to figure it out. There will be limited visibility due to smoke and there may be large volumes of slow-moving traffic – drastically reduce speed, drive carefully and be on full alert. If visibility becomes very poor, don’t attempt to drive through thick smoke or flame – many accidents occur when drivers attempt this, only to find that they run off the road, collide with stationary obstacles such as other vehicles, or are involved in head-on collisions with other vehicles attempting to drive through from the opposite direction. Put your headlights and hazards on so that you are as visible as possible to other vehicles, particularly fire tankers / emergency workers. 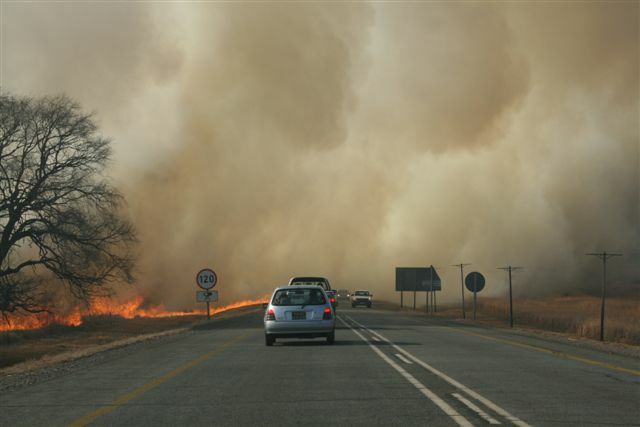 If you are caught in your vehicle during a veld fire, your vehicle will provide a good degree of protection. Look for a clear area, preferably off the road (areas clear of grass or bush will not sustain fires of high intensity). Do not leave the vehicle – people have lost their lives by exiting the vehicle, only to be trapped on foot in the open. Your vehicle will help to protect you from radiant heat, which is the main hazard. Close all windows and vents. Switch the ignition off, it is unlikely that the fuel tank will explode from the heat of a passing veld or grass fire. Stay in the vehicle, as low down as you can get, until the fire front has passed, then exit and inspect the vehicle for damage before proceeding. 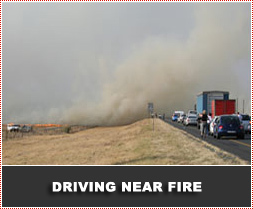 If you are in the veld, away from your vehicle, and you see that a fire has started, move from the fire immediately. Never ignore the fire, even if it seems far away - it can quickly become large and engulf you! The most dangerous situation to be in is when a veld fire is moving up a steep slope, and you are above it with bush and grass between you and the fire. It is estimated that every 10% increase in the gradient of the slope doubles the rate of fire spread. If you feel threatened and you don’t think you can outrun the fire, or if you are surrounded, then find a ‘Safe Zone’. A ‘Safe Zone’ can be an area that has already been burnt, or is completely clear of any fuel that can burn, such as a wide road or an old homestead. The clear area should be as large as possible. Do not panic and run at the last minute! Remember that what will hurt you are the heat that the fire makes, and the lack of oxygen to breathe. Lie down on the ground, cover your head, breathe deeply before the smoke gets too close, and hold your breath when the fire passes over and around you. If you have blankets or extra clothing with you, try to cover any exposed parts of your body. Move over when you see flashing lights at the side of the road or the presence of emergency vehicles or fire engines! Try to stay at least 200 metres from the emergency vehicle. If an emergency exists ahead, it may be dangerous to the public to drive through the area. People who drive into an emergency scene may collide with a fire engine, or worse, a firefighter. Detouring traffic may cause everything to slow down, but it is better getting through slowly instead of getting stuck. Landowners and especially hospitality and tourism businesses operating in an area where wildfires are a reality should pay particular attention to the protection and safety of their guests and employees. The proper control and management of spreading wildfires involves an integrated approach requiring a well co-coordinated plan to achieve the necessary result. It is estimated that as many as 90% of unwanted unnatural fires are caused by human intervention. It is important to know where and when these dangers occur and where the danger areas are. Prevention and control are the secondary steps in wild fire management and follow directly from awareness. Education and the establishment of management systems may be necessary to achieve the desired outcome under this aspect. Educational materials could be provided to staff and visitors. It is also important not to allow unsafe refuse fires, unattended fires or children access to matches. The best way to be prepared is to comply with the provisions of the National Veld and Forest Fire Act, creating and maintaining adequate fire breaks and to join or form a local Fire Prevention Association (FPA) in your area. The Emergency Response plan should go far beyond showing the shortest exit route. Should the fire be of the magnitude that threatens the whole area, responsible command should be taken by senior staff knowing local conditions. The decision to evacuate an area could have serious consequences. Roads may be unusable due to being engulfed in fire or smoke, traffic or fire fighting equipment. It is impossible for a person to outrun a rapidly spreading wildfire, particularly uphill. What are the characteristics of a well co-coordinated response? The dedicated fire management team must be alerted immediately with appropriate staff and guests also alerted and marshaled to a safe assembly or evacuation point. A head count should be made and reconciled with visitors and staff records. Evacuation vehicles on standby in a separate safe area to evacuate guests if necessary. Rapid deployment of fire fighting resources within the structure of pre-planned emergency procedures. Communications to the local Fire Prevention Association or Fire Services. Thatch roofs, buildings and the vegetation in surrounding areas should be drenched. Surplus combustible materials should be removed wherever possible. Emergency medical resources should be placed on stand by. Progress of fire fighting endeavors to be monitored and communicated via a radio system. Careful watch should be directed on the fire out flanking fire fighters or fresh fire fronts being created.  Suppressed fires should be observed for re-ignition. If you cannot see –don’t drive! Do not be the cause of this life-threatening danger - Do not throw away burning cigarette ends! Do not leave an open fire unattended. If you see someone playing carelessly with fire, then tell them to stop.